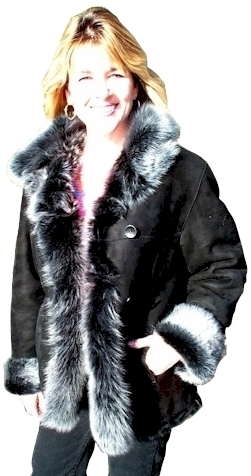 Warm mid-thigh length shearling coat that's made of beautiful Tuscany skins. It is so soft and luxurious you'll never want to take it off, because the shearling inside feels just like fur. The outside of this coat is the suede/hide side of the pelt and the inside has the long hair (wool) all they way through it. 31" in length with slant pockets and adjustable cuffs. Available in color shown and all black.